Bangalore is one of the finest platforms for learning software developers, Crio. The Flipkart co-founder Binny Bansal with the participation of Flipkart employees raised $1 Mn seeding Capital. 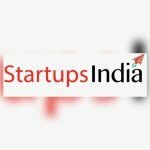 The bit of funding also has been raised from Amod Malviya, Vaibhav Gupta and Sujeet Kumar, founders of B2B e-commerce platform Udaan; Mekin Maheshwari, Founder, Udhayam Learning, and Ravi Garikipati, former Chief Technology Officer of Flipkart.The investment will be reportedly used for building out its product and scaling its employees and plans to add more modules to serve a wider base of technology skills. Crio Founded in 2018 by former senior directors of product management at Flipkart- and they previously worked at Google and Known as Rathinamurthy R and Sridhar Jeyachandran.Crio brings advanced technology and personalized experiences for developers to help them learn the new skills. It uses ‘work like’ micro modules to train developers with real-time experience. Few of its prominent customers include Flipkart, Visa, and Capillary.According to media reports, Binny Bansal said that they are going to increase high qualified tech talented and most of the people are facing around the globe. 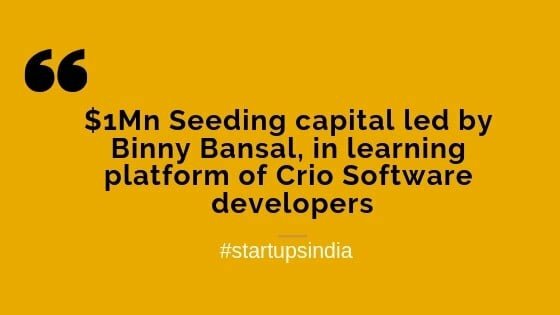 Crio has an exceptional team and its approach towards solving problems as unique and backed with practical insights and experiences.Some of the health and fitness companies are being invested by Binny and also includes CureFit, online food retailer startup – Yumlane, and in some health-tech startups such as Nirmai Health Analytix and SigTuple.Binny has taken up the role of Executive Chairman of Xto10x Technologies, which was founded by former McKinsey and Flipkart executive Saikiran Krishnamurthy.